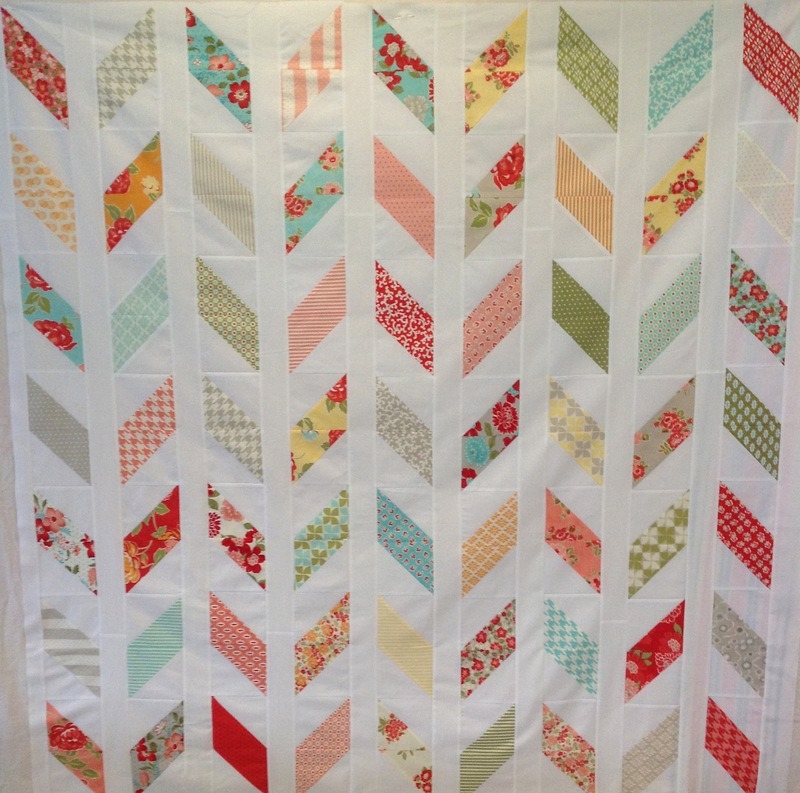 In Reverse – Quilt Top Done! I was able to get my In Reverse quilt top finished this morning. You might notice that I don’t have as many columns as the original pattern, I used two charm packs, one of Vintage Modern and one of Marmalade (by Bonnie and Camille), and 2 & 1/2″ strips from a Kona White jelly roll instead of 1 & 1/2″ strips. I can’t wait to quilt this up! I received two lovely packages in the mail today, the first was an entire pound of lavender buds and oil from Layla on Etsy, I could smell the lavender through the box even though it was sealed in a big zip lock bag. The second was a lovely stack of fabric from Pink Chalk Fabrics. A week or two ago, before I was laid off from work, I had purchased some Brrr by Laurie Wisbrun in aqua and selected a 1/2 yard bundle of QuiltCon Kona Cotton Solids as well as a yard each of Robert Kaufman Essex Linen Steel and Grey. I am super excited about this fabric bundle, all the colours go well together and the QuiltCon Kona Cotton Solids are a gorgeous mix. I’ve got my trusty “Quilting Line + Colour” by Yoshiko Jinzenji to peruse for inspiration. Boy, do I feel guilty staying at home! I was up at 4:00 a.m. this morning, our old pug Winston was pacing and panting so I got up and let him outside. Had coffee and DH got up at his usual time, 5:00 a.m.. After cleaning up the kitchen and starting a load of laundry I began sewing at 6:30. My goal was to finish the quilt top by 10:00 a.m. and successfully finished early, at 9:00 a.m. After folding some laundry and starting another load of laundry, I vacuumed the house and the SOFA — EW!! With two constantly shedding pugs, the hair between the leather cushions could have easily made a litter of puppies! Crumbs and cat toys but no loose change, damn. I was exhausted by 11:00 (I’d done other chores but thought it too boring to include)! I’m afraid I didn’t get much done after 12:00, I ate lunch, mowed the lawn, folded the rest of the laundry then took a short nap and a dip in the pool then watered the hanging baskets outside. I allowed myself a white wine spritzer after 4:00 p.m. and DH rolled into the garage moments later. This entry was posted in Fabric, Inspiration, Life, quilt, Unemployment and tagged Essex Linen, Kona Solids, Laurie Wisbrun, Robert Kaufman, unemployment by Tabatha. Bookmark the permalink. Hi Tabitha, You did a great job on the quilt top. Love the colours on it. Hopefully the job search goes well for you. At least it sounds like you are finding lots of things to keep you busy. Hi Tabitha, just wondering if you have fixed the problem of your thread shredding in your Juki. I also have a Juki 600 and I’m having the same problem. It seems to happen when I’m FMQ. Hi Cnunes, I didn’t resolve the problem with shredding thread but neither did I bring it in for servicing — I really should do that!! Are you having problems?